The house numbers that had been spray painted on the rounded part of the curb at the street level of our driveway were no longer legible. They were just faded areas of chipping black and white paint. I did not get any 'before' photos of our numbers. But they looked similar to the photo to the right. 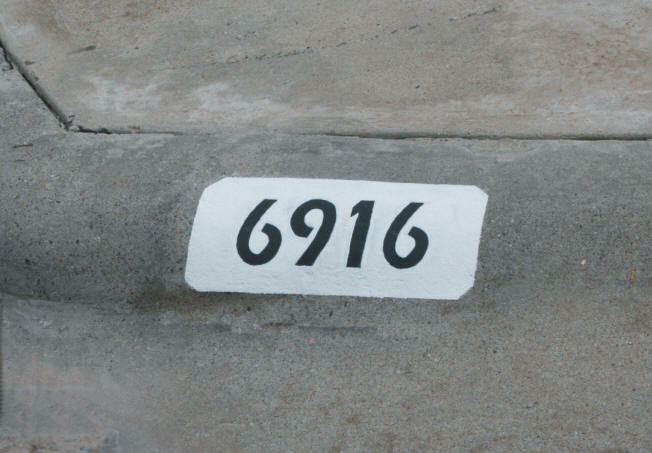 Periodically street/house number painters come around and offer to paint new numbers on the curb for $20 -30. With their cheap spray paint and stencils they do nothing more than mask out a rectangle and spray the background and then the numbers. They do little in the way of preparing the surface properly. Within a year, the paint is coming off, showing the previous paint job underneath. If you live in a fancy gated community or some other housing with a home owners association, you may want to check with them before you take on a similar project. They may have regulations on the colors and size of the numbers. Why even bother with curb numbers? Heck, if I call 911, I want the fire department or ambulance to find my home. Wouldn't you? I do have big 6 inch black numbers smack dab in the front of my house on a light background. Not that the anyone actually 'sees' them. In this area of El Paso, where every house is different.... every house has their house number in a different place, with different sizes, colors, and there are some houses with no numbers at all. It is like looking for a specific tree in a forest. The painted curb numbers, on the other hand, provide "some" consistency. For this simple project, I did not want to go to the hardware store and buy anything. I decided to use only the supplies and materials I had on-hand. You can find the stencils for numbers easily on-line or at the hardware store. Most are made of cardboard and are not reusable. You are also left with extra numbers you have no use for. I wanted my stencil to be reusable. 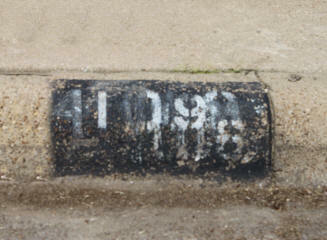 In 3-5 years I want to be able to whip out the stencil and re-paint the numbers quickly on the curb. I used a polyester based drafting material I had on-hand to make my stencil. You can find a similar material at most hobby or craft shops. Just ask for the material to make stencils. You will want a sheet large enough so you have enough area around the numbers to help prevent over spray. You can also place newspaper around the edges. With any computer graphics program or even a program like Word, you can make your house numbers. You can make them the size you want and space the numbers so they are easy to read. The numbers should be at least 4 inches high so they can be read from a distance. No fancy type faces! No italics!. Just simple bold numbers. Remember, you want the ambulance to find your house. 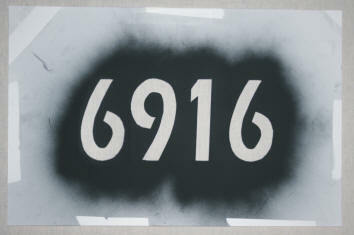 Print out your numbers, trace them onto your stencil material, and then cut the numbers out. Your stencil is now ready. 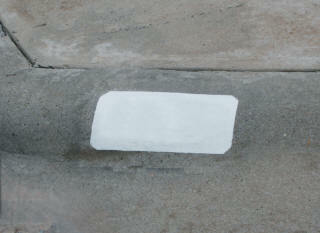 If you have old paint on the curb, you want to get rid of as much of it as you can quickly. To do this, I used my variable speed hand drill and a 3M Paint & Rust Stripper. You just insert the stripper into your drill. It helps to have a variable speed drill to keep the stripper from chewing up your concrete. You want a speed that is only high enough to lightly remove the paint on the surface not the concrete. Use two hands to control the kick back. Use the side of the circle for better control, not the front. Wear a dust mask. Glasses to protect your eyes if the concrete is in bad shape. You probably won't get all of the paint off without destroying the concrete. That is OK. Just make sure your new paint will cover this area. How long does this take? With this stripper, a few minutes. What is you don't have a hand drill or the 3M stripper? You can use regular old sand paper. 60 or 100 grit should do it. You will not get as much paint off with this method unless you do it for a while. 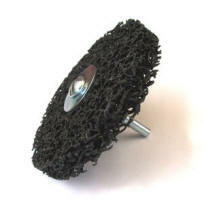 Sweep off the dust and wipe or hose the area down with water to remove all of the dust. 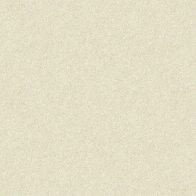 When the area is dry, you are ready to mask off your background area. On the clean dry surface, mask off the background area for your numbers. There should be at least 1 inch around the edges of your numbers. More is OK and may be necessary to cover up some old paint. I decided to make a small corner detail by covering each corner with tape. If you want to get this job over quickly.... use spray paint or if you are using a brush-on paint, then latex. 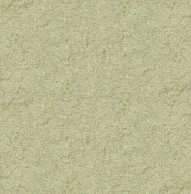 I had concrete paint, which works fine until the paint surface breaks in an area. Then it peels off. The one thing I have noticed over the years, on concrete that has drops of paint on it, is how oil based paint is difficult to remove after it has dried. So as an experiment, I am going to paint the background with an oil-based wood primer which happens to be white. 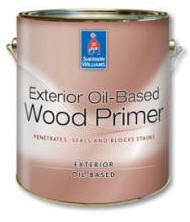 I already had a can of Sherwin Williams Exterior Oil-Based Wood Primer on-hand. I will see if this lasts any longer than spray paint. I painted the first coat. Then a second coat about 6 hours later when the first coat was dry to the touch. Then I let it dry for a couple of days. I was not in a rush to finish this project. And because this is El Paso, where people cannot leave well enough alone. Someone ran over the white paint with their bike. Wiped it off easily with a wet rag. Then the next day a car tire print on one. Wiped it off again. I decided to spray paint the numbers. 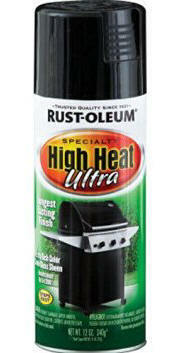 I had a can of BBQ black Rust-oleum High Heat. 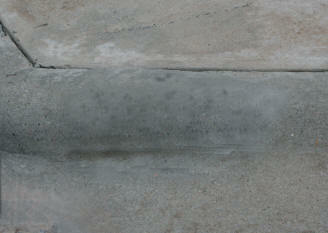 I figured, in the hot El Paso sun, my curb was a good candidate for a high heat spray paint. I placed the stencil over the white background centering it. I then taped it down. On my left hand I wore a plastic glove. 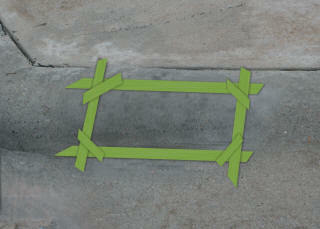 With my right hand, I sprayed using my gloved hand to hold the stencil flush on the curb around the number areas. I did have a little over-spray, which I touched up with a small brush and white paint. Let's see how long this paint job lasts. I will add photos to this page as the years pass to see if the type of paint I used lasts any longer than cheap spray paint.